iOS is the business unit that drives Apple’s profits each quarter, but that doesn’t mean we can write off OS X desktop software — especially now that iCloud has been integrated throughout the just-released Mountain Lion software update. The decision to integrate Apple’s cloud with the desktop is easily the software’s most exciting and significant new feature. While some don’t even know they’re using it, and it has experienced some hiccups, iCloud is still by far one of Apple’s most successful product launches. Since the service opened in October, the company has claimed 150 million users. iCloud is central to the company’s future, which is why Wednesday’s launch of OS X Mountain Lion is such an important milestone not just for users, but for Apple and its third-party developers. Mountain Lion, or OS X 10.8, now available for download from the Mac App Store, is the first desktop OS Apple has built with iCloud in mind. iCloud is deeply entwined in Mountain Lion’s most important features: Notes, Messages, Reminders, Mail, Photos, Calendar, Safari, and most importantly, apps and Documents. The motivation behind the effort is this: how we acquire content and store data today is more fluid than ever. People expect to be able to access their personal appointment calendars and pictures, or books, music and movies they’ve purchased, everywhere. They want to be able to work on their documents on a variety of devices. That’s why Dropbox is a huge hit, and Apple and competitors like Google(s GOOG) know it, which is why both responded to this trend: just last month Google launched its own Google Drive service. 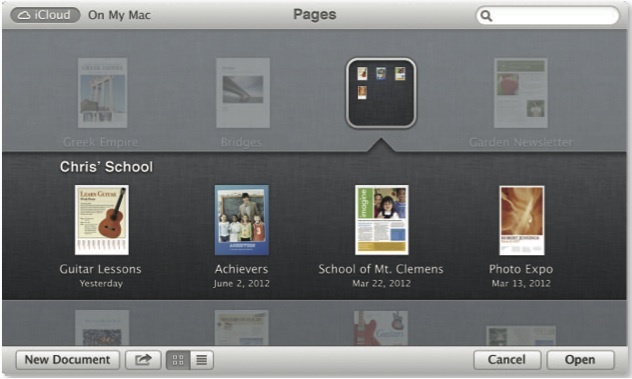 Apple’s iCloud API is an important addition for the makers of Mac apps in Mountain Lion. It allows developers to incorporate iCloud into their own apps, so documents can for the first time be automatically synced and accessed on both iOS and OS X devices much easier and faster than before. And users won’t have to do anything — stuff will just automatically sync. You can create a document on an iPhone, for example, and pick it up and finish it on your desktop, in TextEdit, or another third-party app. Or you can save a document on your Mac that will be immediately available when you need it on your mobile device. This doesn’t just include Apple’s iWork, TextEdit and Preview apps — it extends to third-party developers that sell their apps through the Mac App Store as well. It sounds simple, but it’s a huge step for iCloud and for Apple as well, as the company moves to embrace the future, which is mobile, and not the desktop. It’s also an important step for Apple’s third-party iOS and OS X developers who want to keep users engaged. With iCloud in Mountain Lion, developers can enable users to more easily access their data and, as a result, can follow their users across multiple devices. Engagement is one of the most important metrics for app makers. There are so many apps out there — 650,000 iOS apps, 10,000 in the Mac App Store — that it’s easy for apps to be lost in the crowd. Connecting users through iCloud to apps regardless of the device they’re using is a big boost to attracting and keeping loyal users. A side effect of integrating iCloud further into all of Apple’s flagship products is that iOS users and Mac users will be brought deeper into the Apple fold. Apple has been talking about iCloud as the central piece of the company’s strategy for the next decade, and incorporating it into its desktop strategy assures that. Far more people buy iOS devices from Apple than traditional computers. In the last quarter Apple sold 43 million iPhones and iPads, and 4 million Macs, but Apple recognizes that devices don’t matter as much as the connections. When Apple allows users to access their content and data anywhere, it helps create a virtuous cycle in which those users find they can live (and someday possibly work) in a world of only Apple devices and their associated platforms. That is one of Apple’s ultimate goals. WARNING: Apple’s new “Mountain Lion” OS is infected with a serious virus. Apple is complacent about security. They famously never even attend the regular Black Hat security conference which everyone else in the industry supports. Apple customers are therefore advised to exercise special caution to ensure that Apple’s negligence doesn’t leave them with a serious problem. What rot. ML is much MORE secure by its use of Gatekeeper. And even though I don’t enable Gatekeeper, I’ve never encountered this “virus”. Sophos talking up crap.